I initially began researching and writing about photography as a way to support my artistic practice. As my intellectual explorations became increasingly central to my work, I pursued both an M.A. in Visual & Critical Studies and an M.F.A. in Photography from California College of the Arts. I chose to come to UCSC in order to study with several scholars of race and visual culture whose work I have long admired. I am honored to have Martin Berger as an advisor. Currently in my third year in the Visual Studies Program, I have begun to work on research for my dissertation on the history of U.S. snapshot photography. In my first two years at UCSC I grew intellectually more than I could have ever anticipated. During my first quarter Martin Berger offered a course on the complex relationship between photographs and history that will forever affect the way that I think and write about photography. Later that year Jennifer Gonzalez’s class on race and representation covered the central issues regarding race and visual culture. I was able to extend the lessons from both of these classes through invaluable directed readings with both Martin and Jennifer and through preparation for my qualifying exams, which I passed last Spring. I have also had the opportunity to co-coordinate the Visual and Media Culture Colloquia series. The series allows students in HAVC and Film and Digital Media to collaborate in bringing eight scholars to speak at UCSC each year. Besides the enriching experience of interacting with and learning from scholars that I highly esteem, it is valuable to learn how to logistically coordinate such a series and to juggle university service with my own scholarly pursuits. This year I am excited to host Shawn Michelle Smith, scholar on photography and race who has greatly influenced my thinking. This summer, a Visual Studies Travel & Research Grant and an Arts Dean’s Fund for Excellence Grant supported my preliminary dissertation research. It was an incredible experience. Archival research in snapshot photography is particularly challenging because most archives do not specifically collect snapshot photography per se, but happen to include snapshots in collections that focus on prominent individuals and families. My objective was to survey a broad selection of snapshot photographs from different eras, regions, and economic, racial, and ethnic backgrounds in the U.S., as well as to learn how to utilize archives for purposes that they are not necessarily designed to serve. I went to several archives around the U.S., including the Southern Folklife Collection at the University of North Carolina, the Rubinstein Library at Duke University, the Smithsonian National Museum of American History, the Maryland Historical Society, the Oregon Historical Society, and the archives at the Museum of Modern Art in New York. I looked at more than six thousand photographs. I was able to see how visual trends changed over time, even though current literature on snapshot photography states that its visual formulas have remained static over the past century. This was an invaluable discovery and will help me to develop my thesis regarding how snapshot photography relates to shifts in white racial formation during the twentieth and twenty-first centuries. There were also some disappointments. Archives simply do not have an ample amount of snapshots for the late twentieth century and almost no snapshots from the twenty-first century. Consequently, while I was able to see clear shifts in visual trends from the 1930s to the 1970s, I have much work ahead of me to seek out the recent photographs that are generally not yet collected by archives. Also, because of my plan to visit many archives in a short period of time, I was able to visually analyze photographs, but I had little time to do the more time-consuming work of looking through the historical documents that will eventually help me to connect each family’s images to specific racial histories in the U.S.. I plan to return to some of the archives during the next year. My dissertation analyzes the relationship between the visual appearance of U.S. snapshot photography and the histories that surround it in the latter half of the twentieth century. It weaves these histories together with snapshot photography’s prominent but under-recognized role in shaping fine art photographic practices during the same period. I argue that shared ideologies rooted in race structure the visual language of white Americans’ snapshots, such that conventions visibly shift with cultural politics. Meanwhile, fine art photographers adopt various elements of the visual language of the snapshot to different ends, alternately reproducing the snapshot’s ideological investments, posing meditations upon societal norms, and challenging the confines of fine art photographic aesthetics. I am currently applying for fellowships to fund my next year of research while I write my dissertation prospectus. Findings from my summer research trip allow me to bolster my theoretical and historical knowledge with solid archival material, helping me to demonstrate the value of my research for both the prospectus and the fellowship applications. I strongly recommend that other students also do research in primary sources before the fellowship application season gears up in the Fall of their third or fourth year. It helps to ground one’s developing claims to unique visual evidence. I am also looking forward to an artist’s residency at Djerassi Resident Artists Program in Woodside, California during the summer of 2016. As a dual practitioner in the arts and visual studies, it is difficult to foster my photographic practice in the face of never-ending academic deadlines. My month at Djerassi will give me the time to integrate the knowledge I have gained at UCSC into my own artistic practice. I am amazed at the intellectual and professional skills that I have developed in the past two years under the mentorship of many great faculty in HAVC and across the campus. As I follow their footsteps into a career in academia, I hope to do for students what they have done for me: offer generous support and encouragement as I learn to think evermore critically about the extraordinary social power of images. I am constantly on the edge of my seat, excited about the existing scholarship and possibilities for new contemplations of visual culture. 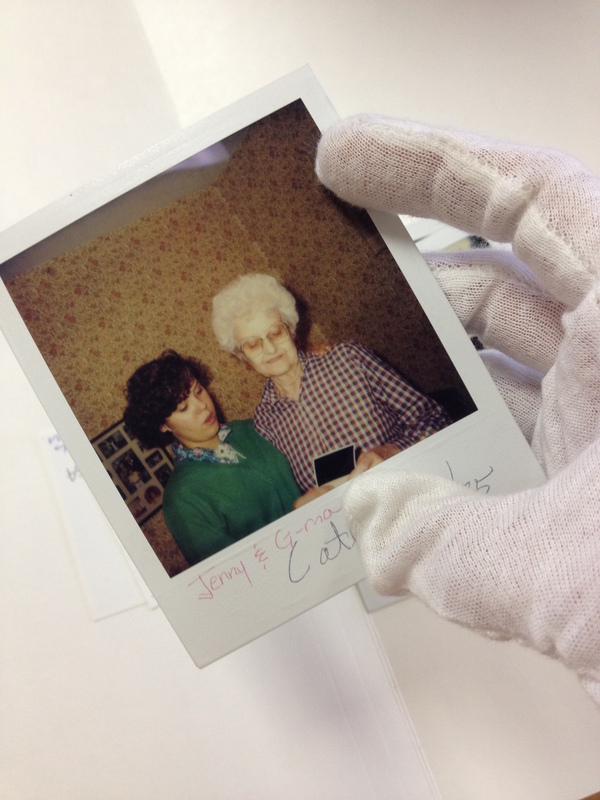 Image caption: Unknown photographer, Jenny & G-ma, 1985. Polaroid. Paul Green Papers, Southern Folklife Collection, University of North Carolina at Chapel Hill.